Mount Rainier and the White River Valley in late Summer from the vantage point of the Sunrise Rim Trail in Mount Rainier National Park. Foreground flowers are Alpine Aster (Aster alpigenus) and Paintbrush (Castilleja parviflora). Back in 2012 I was on a trip photographing Mount Rainier National Park. 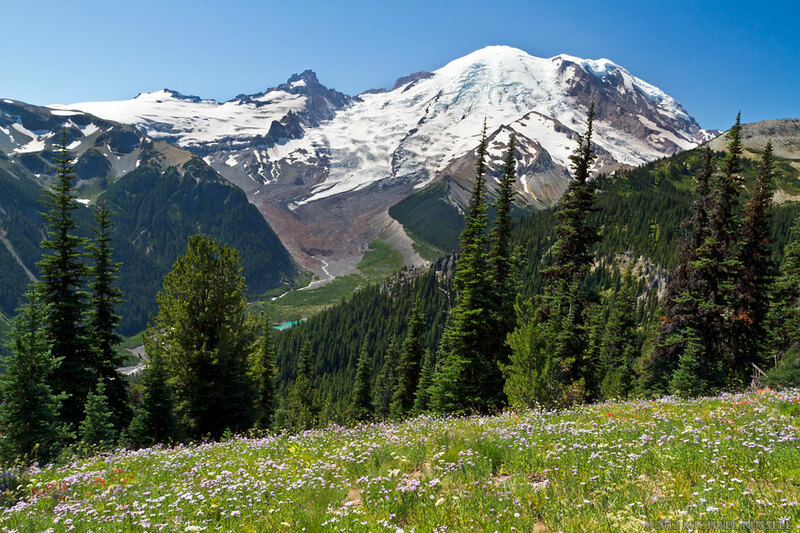 This was the first time I had visited at a good time for the wildflower display at Rainier. I had already photographed some great flower displays at Tipsoo Lake, but was visiting the Sunrise area as Paradise was fogged in. You can’t see any of the clouds in this photograph but on the other side of the mountain visibility was very poor all day. From Paradise you could barely make out the Tatoosh Range through all the clouds. This is one of the reasons I enjoy the fact they have web cameras at various areas of the park – I can scout the locations ahead for time for weather that might be a problem. On this day I opted for the Sunrise area over Paradise (due to what I saw on the webcam) so I would be able to see Rainier itself. This photo is from the Sunrise Rim Trail on the way back from Shadow Lake. For more images of this area visit my Mount Rainier National Park Gallery in my Image Library. A really beautiful photo, i went there around 2011 and it was breathtakingly beautiful. This photo conjures happy memories:) Ella.